"We were starting to get away from songs that were freaky but didn’t have any emotional content, you know?" Many came to know the Flaming Lips via the Vaseline-happy fluke hit “She Don’t Use Jelly” from 1993 and their 1999 full-length magnum opus The Soft Bulletin a few years later, which acted as their “Creep” and OK Computer respectively in the public and critical eye. But in between was 1995’s Clouds Taste Metallic, their very own The Bends (released the same year even). It marked a transition from the acid-spiked guitar rock the Lips had purveyed for over a decade and the experimental orchestral bombast that would follow. The album didn’t have any big hits, though its closing hymn “Bad Days” ended up in Batman Forever, and songs like “Christmas at the Zoo,” “This Here Giraffe” and “Evil Will Prevail” helped point a band of fractured, ragtag Oklahomans toward the more beautiful precincts they still explore even today on this year’s surprisingly McCartney-esque Miley Cyrus collaboration. 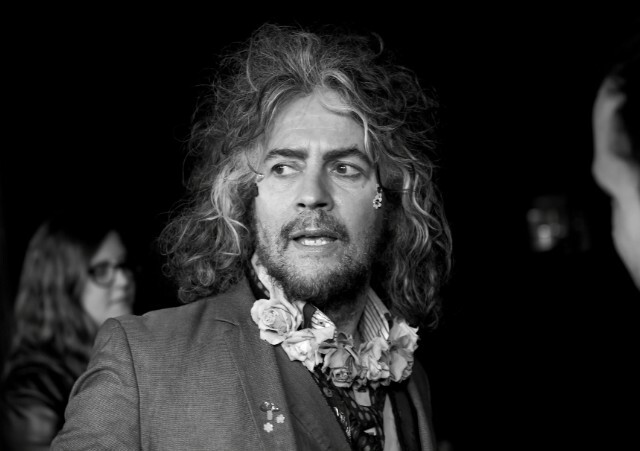 For its 20th anniversary, SPIN spoke to Lips leader Wayne Coyne about how Clouds furthered the band’s divergence toward artistic success that no one could have predicted at the time. What do you think of Clouds Taste Metallic 20 years later? We’ve discovered as we’ve gone along, that as you’re making [records] you love them but almost immediately as you put them out you start to be like, “Ugh, I’m uncomfortable with that.” It gets to be a couple years old, and it feels like you’re not that person anymore, so you kind of reject it. But, we discovered that as the record got to be, like, ten years old, you really did separate from it, and didn’t really think, “Oh that’s not even me doing it, even though it was.” Speaking of myself as if it’s some other entity, I love it, yeah. Were there any bizarre expectations on you guys after performing on 90210? Did you know at the time that it was going to be the last record that you made with guitarist Ronald Jones? While we were making it, the things that we know about him now, there’s no way we could have known that then. I think we’d already finished the record by the time he had announced that he was gonna quit, and then he still played a few of the shows. Probably for a year after that it still felt like, well, he might come back. So it was never an immediate death in the family so to speak. I didn’t really feel like Steven [Drozd, Flaming Lips multi-instrumentalist] and I were that compatible with Ronald. I think we loved what he did but if we had to go his way, I don’t think we would’ve made records like that at all. I think that was us, Steven and I, struggling and saying, “I think we’re gonna try to do this,” and doing everything we could to incorporate his stuff into that. So, it was beautiful but it was not easy. Wasn’t that a hint that it might not work out with him? No, I mean, if he would’ve stayed in the group, we probably would’ve just said, “This is a great group, let’s figure out what to do about that.” Him leaving wasn’t anything that we wanted; he decided to leave. But like I said, once he had left, Steven and I would say, “Well, man, this is a lot more fun… with him not being here.” I remember after Clouds Taste Metallic, Ronald talked about changing a part to a song that was on [1993’s] Transmissions from the Satellite Heart that had come out three years earlier. I’m like, “We’re already done with that.” How do we go back and redo it, you know? But I love that about him as well. He had no common sense about it. It was purely that he loves music and music loves him. Where did the title Clouds Taste Metallic come from? What song title on the record had the best inside joke behind it? There’s a lot of good titles on there. I really love the title “Psychiatric Exploration of a Fetus With Needles,” it’s just so absurd. I don’t know what the f–k it means but that’s what this song is. Do you typically have a title before you write the song? Sometimes I’ll come up with songs [where] the song itself doesn’t really say what it’s about but the title does, and sometimes it’s the other way around, where the title doesn’t say anything but the song says everything. Sometimes you just have songs where a title is exactly what it should be, like “Do You Realize? ?” It’s like, “Well that’s the name of the song! There’s nothing more that we have to say about it.” I don’t think any of the titles felt as good as [“Psychiatric Explorations”], but “The Abandoned Hospital Ship” is a pretty great title. It just gives you this sort of mood before you even hear it. It seemed like a scene out of a movie. Was “Evil Will Prevail” the beginning of the obsession with good and evil that you’d go on to explore on The Soft Bulletin and Yoshimi? We were starting to get away from songs that were freaky but didn’t have any emotional content, you know? As much as a song like “Psychiatric Exploration” is fun, there’s not an emotional thing in it. We were starting to have a desire for that to drive us with our music. Earlier incarnations of the Flaming Lips just weren’t good at playing anything, let alone purposely doing emotional music. We would stumble upon things that were emotional but we didn’t know how to do them again. The Soft Bulletin was almost pure emotion, which I’m thankful for, ‘cause I think we really were lucky that we were so drunk on our stupid ideas that we actually stumbled upon some that were good. Doesn’t a song like “Christmas at the Zoo” fall between the wackiness and the emotion? It has that weird premise but also a euphoric feeling with weight to it. Yeah, you’re exactly right. We would have these things in the music but we wouldn’t always be able to realize them in the song at that time. You have to do the song in the time that you have. It’s better to get something out of your system that you don’t like, than keep it in your system and not know that you don’t like it. Do you have a least favorite song on the record? I think our least favorite one was “They Punctured My Yolk.” When we went to play it at the Clouds Taste Metallic show in February, it [became] one of our favorites after we changed the arrangement — it was still that song but just a more fun, dynamic arrangement. It turned out to be probably the highlight of the night to tell you the truth. The song that we didn’t like, we changed it to something that we absolutely like. What was the label’s reaction when you turned in the record? I think they always would just, you know, peek into what we were doing and be like, “There they go. That’s on time and they’re making a f–king cool record.” I think there was a lot of great effort by them to say, “If we let those guys do their thing, I think they’re gonna really do some cool stuff.” We didn’t know we were gonna do Zaireeka or Soft Bulletin or Yoshimi Battles the Pink Robots. We just thought, “F–k, we’re just figuring stuff out, let us try.” And I think they had a good sense of that. Was there any issue with there not being another obvious “She Don’t Use Jelly”? How did “Bad Days” end up on the Batman Forever soundtrack? While we were working on Clouds Taste Metallic, they wanted a song and it was the only song that we really had and said, “What do you think of this?” They actually loved it, and built the scene in the movie around the song. We were on this crazy giant record with U2 and Seal, who was a big pop artist at time. Then we were thinking we didn’t want “Bad Days” on Clouds Taste Metallic and on the record itself there’s a big gap, then it comes up at the end. They were like, “Hey, you’ve got to put this song on there — everybody loves this song.” And we were like, “Oh, you can hear it on the Batman soundtrack.” And they’re like, “No, no, you better have it on your record, too.” And I think they were definitely right. Even by ‘90s standards, isn’t that soundtrack one of the weirdest batches of artists? I think it set up a blueprint that you could really have an interesting soundtrack that really doesn’t have that much to do with the movie and people would accept it. It was just a record that had another branding that went with it. I thought that was really a cool move, that it didn’t always just have to be a group of popular artists doing something to promote the movie. It really was a weird mixtape collection that had a movie with it too. You liked it even less than Batman and Robin — the George Clooney one? Do you consider Clouds to be the end of an era? I think Steven and I would say it is now. That that was the peak of when we thought of ourselves as a rock band — loud guitars. He played drums and I sang and played guitar and that was what we were doing. And we got to where we just wouldn’t do that anymore. But luckily we followed our desires to be something different. Do you have any other anniversary plans for the album? We’re doing this big, four-record set that’s got a live show from Seattle and also a collection of oddities that were around then; I don’t know if they’ve all been released. You can find them on some pretty deep Flaming Lips sites out there, but there’re some things that we’ve never put out. And I think there’s a pretty good documentary in the works about it but, we don’t have all that done yet. Now that it’s coming up to the anniversaries of some of your best-loved work, it would be amazing to have the reissues include, like, Zaireeka-style versions, separating the tracks for other albums like Clouds or Soft Bulletin. You saying that does make me consider that, maybe that would be something that people would be interested in. Why don’t we put these ideas out there and see if people are really interested in them? I am, but I don’t always know if just because I’m interested that means it’s interesting. Or you could always return to the gummy realm. [Laughs.] I don’t know that we’ll do that any time real soon but, you know, we love all that s–t.